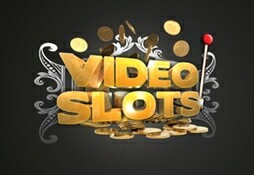 Videoslots Casino is a busy and vibrant site that is the answer to a slot game lover’s prayers. This site is crammed full of slots from an extensive list of providers, and also offers plenty of other real money gaming options to choose from. There are more than one thousand games available at this incredible online casino, so no matter what your preference you will be able to find a host of gaming options here, including potential millions to be won from progressive jackpot games. With such a massive selection available at this bright and well-run casino site it is no surprise to see it atop many people’s lists of must visit online casinos. Video Slots launched in 2011 and since that time has maintained a significant online presence by focusing on video slot games to attract new players. In fact, despite the name this online casino also boasts a rich variety of traditional casino table games to appease those who prefer classic casino games. The site takes client security extremely seriously, as evidenced by its license from the very strict Malta Gaming Authority, which ensures both security and fairness at this casino. A generous welcome bonus is another reason to try Video Slots out for size, but it is the exciting weekly Casino Races which really set this site apart from the competition. When you sign up with Video Slots you qualify for the 100% matching deposit bonus based on your first deposit to the site. This great welcome offer matches your deposit to a maximum of €200, and all funds are available to withdraw after the deposit amount has been wagered 20 times within 7 days after claiming your bonus. While this may seem a lot, it is a dramatically lower wagering requirement than you will find at the vast majority of online casinos, making this a pretty awesome offer. 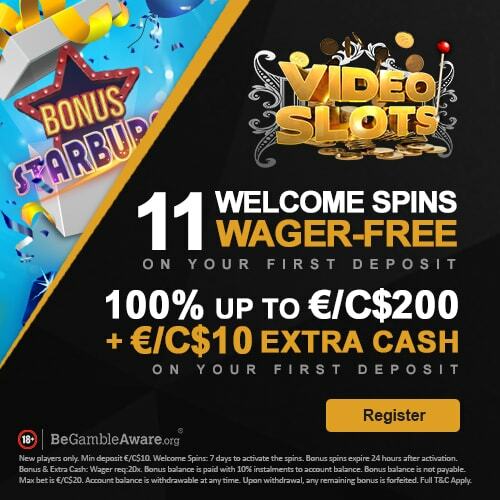 If all of that wasn’t enough, you will also get a free €10 cash bonus when you make your first deposit, making this an absolutely fantastic welcome bonus offer. While there is no formal loyalty scheme in operation at Video Slots, the exciting Casino Races and Slots Battles offer great ways to win player rewards. You will receive 11 welcome spins in a random game upon first deposit. You have 7 days to activate the bonus, once activated free spins must be used within 24 hours. You must be 18 or over to play and 21 in countries where that is the minimum age by law – Play Responsibly. Video Slots offers a large range of payment methods so as to allow customers to choose the best option for them when it comes to making deposits and withdrawals. Visa and Mastercard are popular options for many players, but remember that Mastercard do not permit withdrawals from gaming companies for customers outside of the UK. Other options here include the Paysafecard voucher scheme, which is as close as you can get to playing with cash money. There are also electronic wallets like Neteller and Skrill as well as dozens more payment options to suit players from all around the globe. One withdrawal per day is free of charge at VideoSlots, although if you make multiple withdrawals on the same day a €2.50 fee will be imposed per transaction. Video Slots promise the same levels of security as would be provided by an online bank, so all transactions are fully encrypted and private data cannot be accessed by a third party. The selection of gaming options available at Video Slots Casino is quite simply staggering. The huge number of game providers which service this site includes such illustrious names as NetEnt, Microgaming, Betsoft, Yggdrasil, NextGen, Thunderkick, Play’n GO and Quickspin. This truly is a mecca for video slot games, including some of the biggest jackpot slots on the market, but the site does not neglect casino table game fans either. For example there are more than 40 different blackjack games available at the site, which should give you some idea about the range of games on offer here. Although the quantity of table games outside of blackjack and roulette is somewhat limited, this is more than compensated for by the immense range of slots and other games on the site. The Casino Races allow players to jockey for position on a weekly leaderboard as every spin over 20 cents counts as points which can move you up the table to enable you to claim cash prizes. Another exciting game feature is the Battle of the Slots where players sign up for spin contests on selected video slot games to win more great prizes. As a further incentive to sign up, Video Slots publishes the return of each and every game on the site in the Game Payout section, so slot gamers can check to see which are the hottest games with the best returns to players. How an online casino interacts with its players is crucial to sustaining success in this industry, and Video Slots commitment to excellent customer service shines through. The FAQ section of the site should be able to provide the answer to many player questions, but there is always the option to contact customer support 24 hours a day every day of the year. Live chat is the most popular way to resolve queries quickly and with a minimum of fuss, but there is also an email address if you need to send any attachments such as screenshots or document scans. There is also a telephone number available and it is possible to arrange a call-back if you do not wish to bear the cost of the call yourself. It is even still possible to send documents via post to VideoSlots headquarters on the island of Malta. Video Slots Casino has a vision which encompasses “technical excellence, exceptional customer service and market leading game play innovation” and this superb online casino has managed all of these. The site was recently awarded the dual honour of being named Best Casino and Best Gaming Experience in 2016 by the respected CasinoMeister site, which is an illustration of its regard within the gaming industry. Video Slots provide their players with an enormous selection of games from the best providers in the industry, making this a one stop shop for all your online gaming needs.